The Samuel Ashley Stevens House is a stop on Huntington Historical Society’s Holiday House Tour. In the early 20th century, the home was occupied by a Huntington Village merchant, his wife and three daughters. Travel back into history this holiday season by venturing on Huntington Historical Society’s annual Historical Holiday House Tour. This community tradition tells the stories of some of Huntington’s historic homes that are decorated for the season and open to visitors. The Historical Society has been organizing such tours since its beginnings in 1903. Following a hiatus, the tradition was revived in 2005, making this the Society’s annual tour. Participants in the self-guided tour receive a booklet with a map to guide them on their journey around the town of Huntington, and a short history of the homes they will visit. Five holiday historic homes will be featured, as will the society’s 1795 Kissam House. There, visitors can take in the Poetry in Thread exhibit, and browse the Antiques and Collectibles Shop, fully stocked with holiday gifts. The 1750 Conklin Farmhouse will have a delicious buffet spread. “Our Holiday Historic House Tour offers a chance for attendees to celebrate the holiday season and highlight the wealth of important history and beautiful homes we have in the Town of Huntington,” Historical Society Executive Director Tracy Pfaff said. Every house on the tour holds a historical value that will be explained by volunteer docents. The Society’s committee researches to find homes with a unique past. As Pat Ernst, a tour committee member describes, it is “a lesson in history dressed up for the holidays.” Each docent will detail the evolution of the home, the impacts the people who had lived there made in Huntington, New York, Albany and Washington, and even tell the story of certain furnishings. “Huntington’s House Tour is always enjoyable and historically representative of the beautiful homes in the area,” Bruce Adams of Northport said. “Holiday House Tour of Historic Houses is both a mission program, showing off historic houses of Huntington, and a fundraiser,” Pfaff said. Proceeds from the tour will benefit the Society’s many programs, events and research. The Society provides public education programs, school and scout visits, research and genealogy resources, and interpretations of historic properties through historic house tours and exhibits. “The proceeds support our mission to serve as the focal point for preserving the ongoing heritage of the Town of Huntington,” Pfaff said. The tour is set for Sunday, Dec. 2, from noon to 4 p.m. Tickets are $40, $35 for members, in advance. Purchase online at huntingtonhistoricalsociety.org, or call 631-427-7045 ext. 401. Ticket price increases by $5 if purchased the day of the tour. Crowds gathered at Professional Automotive Service on New York Avenue in Huntington as over 2,500 turkeys were handed out to families in need during the annual Sorrentino Turkey Drive. Lines stretched down the block from Professional Automotive Service on New York Avenue in Huntington Monday night where hundreds gathered for the ninth annual Sorrentino Turkey Drive. Andre Sorrentino, co-owner of PAS and Huntington’s director of general services, spearheaded the event during which a total of 2,650 turkeys were collected and handed out to local families in need. The event has become an annual tradition in which local firefighters, police officers, high school students, businesses and volunteers work together to ensure that every family has a turkey dinner on Thanksgiving. Sorrentino said there was an “unbelievable turnout” for the 2018 turkey drive. “Thank you to all of you who helped out,” Sorrentino said to the crowd of family, friends, town and county officials and volunteers who gathered at PAS to help hand out thousands of turkeys. Huntington Supervisor Chad Lupinacci, left joined, Director of General Services Andre Sorrentino at the Sorrentino Turkey Drive. Volunteers worked for over two hours distributing turkeys to the those in need, all as people continued to arrive with turkeys to donate. Suffolk County Executive Steve Bellone thanked Sorrentino and his family for their hard work to “bring out the best in our community” during the holiday season. Assemblyman Steve Stern, Suffolk Legislator William “Doc” Spencer, Huntington Supervisor Chad Lupinacci, and Councilmembers Joan Cergol, Mark Cuthbertson and Ed Smyth also attended the event and thanked the Sorrentino family for making the event possible. Billy Joel cover band Big Shot, led by singer Mike DelGuidice, takes the stage at The Paramount for a concert to benefit General Needs. One of Long Island’s most revered cover bands will be returning to the stage at The Paramount in Huntington tomorrow night, and once again it will be for a good cause. A portion of the proceeds from tomorrow night’s show featuring Mike DelGuidice and Big Shot at The Paramount in Huntington village will benefit charity General Needs. East Northport-based General Needs is a non-profit organization that provides clean socks, underwear, t-shirts and other much-needed items to homeless veterans from Brooklyn to Riverhead, according to the organization’s founder and president Lonnie Sherman. Sherman said General Needs first got in touch with the Paramount three years ago about a charity concert through TD Bank, one of the organization’s major donors. DelGuidice, 47, of Miller Place, is happy to be able to use his fame as the frontman of Big Shot, and a touring member of the Billy Joel Band to give back to a local Long Island charity. In 2011, DelGuidice give Big Shot an unprecedented level of authenticity when he added two members of Joel’s actual touring band to Big Shot’s line-up. Joel’s lead guitarist Tommy Byrnes and drummer Chuck Burgi joined bassist Nick Dimichino, keyboardist Carmine Giglio and saxophonist John Scarpulla, and gave the cover band a sense of legitimacy. After the show, Joel personally hired DelGuidice to join his band, and he continues to tour with the Billy Joel Band playing rhythm guitar and singing vocals. Big Shot’s live shows at The Paramount always have a buzz of excitement following a performance in June 2016 when Joel made a live guest appearance with the band on stage, much to the delight of the Huntington audience. With chilly weather already upon us, and freezing temperatures just around the corner, this is the time of year when homeless veterans are in particular need of warm socks, blankets, winter coats, boots and other items that General Needs provides. A portion of the proceeds from the concert will be donated to General Needs. Tickets for tomorrow’s concert at 8 p.m. cost between $20-$60, and are selling fast. Tickets can be purchased at the box office or online at Paramountny.com. The Greenlawn Civic Association hosted Sunday the second annual Greenlawn Community Day at Coral Park. The event saw participation from a variety of community groups including the Harborfields Council of PTA’s, Harborfields High School Student Government, the Vanderbilt Museum, Greenlawn Fire Department and a very busy table hosted by the Harborfields Public Library. All activities at the event were provided free of charge and helped promote businesses and community organizations in the Greenlawn area. Huntington Councilman Mark Cuthbertson praised the Greenlawn Civic Association for organizing the event. The Greenlawn Civic Association said the event was a big success, and hope it will continue to grow next year. Alexandra Miller-Henson started S(care) to help local shelters. 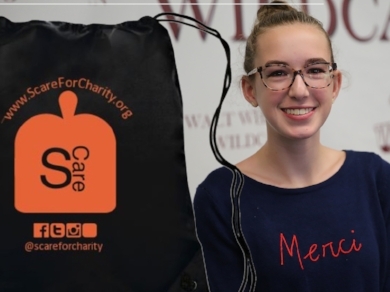 As a way to thank donors, she is gifting them a S(care) bag. oky season is upon us and that means it’s almost time to dress up in costume and go trick-or-treating, but this year instead of just getting candy, kids and teens can donate to a good cause by getting involved with S(care). The non-profit charity created by Walt Whitman sophomore Alexandra Miller-Henson encourages trick-or-treaters to collect items from their neighbors that will be donated to a local shelter. In its second year, Miller-Henson has been working to get the word out about her charity and bring it to more parts of Long Island. “I was talking her about how I wish there was a way for me to trick-or-treat for a good reason, with an excuse to go trick-or-treating and we basically came up with the idea on the spot there,” Miller-Henson said. Last year she focused primarily on getting people at her high school involved. Now she is ready to expand through friends and social media. “I think it’s a fun twist on Halloween, y’know scaring for a cause, scaring for a care,” Miller-Henson said. Last year, S(care) donated to the Family Service League, but is unsure which shelter she will donate to this year. The charity is asking for donations of toiletries, socks and feminine products. Miller-Henson has already collected some donations from family and friends, and is expecting a large wave of donations to come in after Halloween. Anyone can sign up on the website, scareforcharity.org, to round up donations on Halloween night. Directions have been assembled on how to have the most successful collection. People can drop off donations at Walt Whitman High School, Stage To Screen, Craftree and 110 Party Supply during their business hours. “If everyone helps out a little bit, we’ll be in a better place than we are now,” Miller-Henson said. Last year, S(care) donated over a thousand items to the shelter, and Miller-Henson hopes she will be able to amass even more with her large outreach. “I can’t picture me not running it, because it’s made me look forward to Halloween even more than I already did,” Miller-Henson said. “Halloween has been my favorite holiday for forever so… I couldn’t imagine a Halloween without it.”donations. Former “Mike & Molly” star Billy Gardell is scheduled to take the stage for a night of comedy at The Paramount Saturday. Early in his career, comedian Billy Gardell lived in Huntington for a short time, testing his comedic chops at the storied East Side Comedy Club where Eddie Murphy and Jerry Seinfeld also got their start on stage. Gardell, 49, is returning to Huntington this weekend when he is scheduled to perform a standup routine at The Paramount. Best known for his role as Mike Biggs on the CBS sitcom “Mike & Molly,” Gardell said he “always had an affinity” for comedy. Gardell starred in “Mike & Molly” for six seasons alongside fellow comedian and actress Melissa McCarthy, and he said the two developed a close bond. “You just have to find your own voice,” Gardell said. The funnyman described his comedic style as “working class,” and said that he tries to find the humor in what happens in day-to-day life. “I think it’s important to try and find a universal theme in my standup,” Gardell said. Gardell said he continues to tour and perform standup comedy because there is something addicting about writing a new joke that, when it goes over well with the crowd, keeps him getting back on stage. Drawing on his own life experiences, Gardell said his jokes often focus on the very relatable themes of marriage, parenthood and growing old. “I like to think that I get my audience to switch off for a while and just enjoy the show,”he said. Gardell is set to take the stage on Saturday night at 8 p.m.; doors open at 7 p.m. Tickets for the show run from $19.50-$49.50 and can be purchased at the box office or online at Paramountny.com. 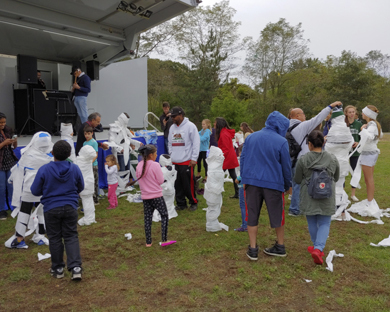 In its 25th year, the Long Island Fall Festival in Huntington, presented by the Huntington Township Chamber of Commerce was a tremendous time for all who attended. Various vendors lined up on the streets and throughout the park, an international food court could satisfy anyone’s appetite, a massive carnival lit up the night, and live music could be heard throughout the day. With three stages set up, a main stage at Chapin Rainbow Stage, rock central at Scotto’s Carnival Stage and folk performers at Acoustic Stage, there was music that could catch anyone’s ear and make them sit down for awhile. 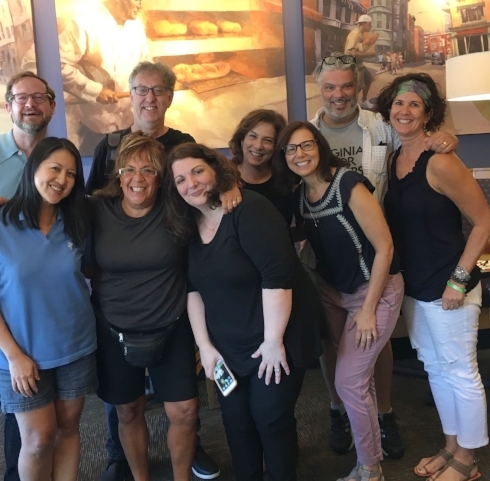 “By bringing everyone together from the Northeast, not just Long Island, they enjoy everything and it’s a real relaxing weekend for whoever attends,” Yudewitz said. Yudewitz felt that many people came to the festival because of its “staying power”. Even though, it was contained in the park and its bordering streets, there were endless things to check out and tons of community members to meet. With over 100 vendors, you could easily spend an entire day shopping. “Hundreds of thousands of Long Islanders come every year and it’s just a great way to be present in the community, meet new people and spread the word about our brand,” Christopher Vetter, founder of Sail Away Coffee Co. and vendor at the festival, said. With the Fall Festival come and gone, the Huntington Chamber of Commerce is already preparing for next year’s extravaganza. The meatball-eating champ has a partner now. Len Piros of Centerport, for two years in a row the winner of the Long Island Fall Festival Meatball Eating Contest, went for the three-peat Sunday afternoon. Instead of a trophy and the three-peat, Piros now has a co-champion. Ryan Thomas kept pace through both the competition and a tie-breaking run-off to grab a share of the title. In all, 10 competitors came to the table where staff from Porto Fino restaurant loaded each plate with 10 meatballs. After three minute on the clock, Piros and Thomas were tied. They went head-to-head in a one-minute runoff. A sudden death runoff was ruled out and the emcee of the event, Huntington Supervisor Chad Lupinacci presented the still-chewing pair to the crowd as co-champions. Len Piros, left, and Ryan Thomas, third from left, are congratulated by Huntington Supervisor Chad Lupinacci and Festival Co-chairman Bob Bontempi. Working in two different mediums, artists John Cino and Pamela Waldroup have found commonality. The artists, who are exhibiting together at fotofoto gallery in Huntington, explore dimensionality in their own ways. Titled Sympathetic Sensibilities, the show reflects “our shared sensibilities regarding form, rhythm, shape, and nature,” Waldroup said. They came together when Cino selected Waldroup’s pieces for a Patchogue Arts Council exhibit he was curating. As curator Cino was unable to show his work at that show, but Waldroup went to one of his openings and felt the connection between their work. Cino is from Patchogue and welcomed the idea of bringing his creations to a new community. Waldroup felt Cino’s work would complement hers well. “Last year I had a solo show there, but this year I wanted to do something different. What John and I have done is transform the space,” Waldroup said. “What I like about when I walk into the gallery now is there is a conversation that you can feel between his work and mine,” Waldroup said. In her work, Waldroup puts an emphasis on a subject’s lines, shadows and contrast. Cino does the same in a three-dimensional form. Waldroup has a fine arts degree but a workshop in Florence introduced her to photography. She taught fine art and digital photography at Northport High School for 32 years until retiring last year. For Cino, he found his love for sculpting in college and knew this would be what he would pursue for the rest of his life. His pieces falls into two categories, a free flowing wave and a rectangular box with waves inside, he considers this to be like a book and the markings are a “language”. An artist’s reception will be held at the gallery this Saturday, Oct. 13, 5-7 p.m. The artists will also be at fotofoto gallery during Huntington Art Walk, Sunday, Oct. 21, noon to 4 p.m. The Town of Huntington celebrated an event filled Columbus Day Weekend that culminated Sunday with the 20th Annual Long Island Columbus Day Parade through Huntington village. 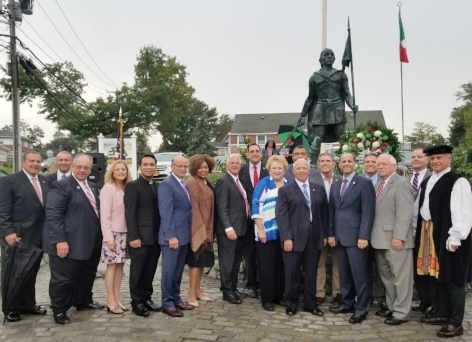 The ceremonies kicked off on Oct. 4 with the raising of the Italian flag above the Christopher Columbus statue at the intersection of Lawrence Hill Road and Main Street in Huntington village. Huntington Supervisor Chad Lupinacci, Councilmembers Eugene Cook, Joan Cergol, and Ed Smyth, Town Clerk Jo-Ann Raia and Tax Receiver Jillian Guthman were joined by State Assemblyman Steve Stern (D-Huntington Station), County Comptroller John Kennedy (R-Suffolk County), County Legislator William “Doc” Spencer (D-Centerport) and members of the Order Sons and Daughters of Italy in America to show their support for the town’s Italian-American community. Lupinacci assured the gathering that the 9-foot-high bronze statue of Columbus, which was unveiled across from St. Patrick’s Church in 1971, was going nowhere. “As people have made allegations of the Columbus Day holiday over the past few years… this statue is here to stay in Huntington standing taller, and larger, with broader shoulders,” Lupinacci said. The Columbus statue was commissioned by the late Sam Albicocco, an Italian-American and prominent Huntington businessman. Lupinacci said Albicocco purchased the land for the statue and funded the construction of the statue with donations from local Italian-American residents. The statue was transferred to the town in 1994. The 20th Long Island Columbus Day Parade kicked off three days later on Sunday at the corner of Park Avenue and Main Street in Huntington. Lupinacci served as the parade’s co-grand marshal with NYS OSDIA President Robert M. Ferrito, News 12 anchor Antoinette Biordi and Italian media personality Dr. Vito DeSimone. The parade coincided with the annual Long Island Fall festival at Heckscher Park, and the 1.5-mile route that ended at the Columbus statue was lined with people. Members of over 24 OSDIA lodges in Nassau and Suffolk could be seen marching with banners and Italian flags. Marching bands from Walt Whitman, Deer Park, East Meadow, Islip and W.T. Trespar Clarke high schools filled the air with music. The parade also marked the 113th anniversary of the Order Sons of Italy in America. Lupinacci said the Italian Flag would continue to fly above the Columbus statue for the rest of October to celebrate Italian-American Heritage Month. The cast of Maria Adcock, Lisa Leshaw, Kathy Radigan, Barbara Solomon Josselsohn, Barbara Herel, Kate Mayer, Lance Werth, Neil Kramer, and Tony Mennuto are ready to tell you a story. Delve into the funny, crazy, unbelievable, and at times heart wrenching stories that make up nine storytellers’ family histories at “Every Family’s Got One (a story, that is),” premiering its first show on Oct. 11 at Cinema Arts Center in Huntington. Producers Barbara Herel and Kathy Radigan have curated a lineup of performers who are ready to dive into their families’ pasts. While working together on another storytelling venture, “Listen to Your Mother,” the producers discovered they lived near each other on Long Island. In the search of a new project to pursue, Herel came up with the idea to put together a show centered around family. Radigan was completely on board. “I just thought of ‘what do I love to hear?’ and I love to hear people’s crazy stories about their families, I definitely have a few of my own to tell,” Herel said. As performers themselves, Herel and Radigan, will be on stage, along with Maria Adcock, Lisa Leshaw, Barbara Solomon Josselsohn, Kate Mayer, Lance Werth, Neil Kramer, and Tony Mennuto. “We’re not only showcasing our work, we’ve really been reaching out to incredible writers and storytellers all over the place,” Herel said. Herel and Radigan have been working since the spring of 2017 to develop their project. They launched a website in January with weekly blog posts covering all sorts of topics about family. “We really come from so many different parts of the universe - politically, socially, economically - and yet family is still family. We all have those moments that are universal,” Radigan said. The blog went to the next level when they began to host a weekly Facebook live. This allowed them to connect with the public, which is what storytelling is all about, according to Radigan. Once they put the show together, they knew they wanted to bring it to the local community. Five of the nine performers come from Long Island but each bring a different perspective. Still, Herel and Radigan believe people can relate to each story in some way. Each storyteller will have five to eight minutes to weave their tale. One after the other, the stories will build on each other. The cast has formed a family of their own. As defined by the producers, family is “the people in your life who support you”. “In these fractured times, Barbara and I feel one thing you can always talk to people about is a family story,” Radigan said. Tickets can be purchased online at Everyfamilysgotone.com for $35, or at the door for $40. A portion of sales will be donated to the Visiting Nurse Service of Suffolk County. The show is for mature audiences. George Wallace, right, met with international poets, Guiseppe Napolitano, Italy; Shaip Emerllahu, Macedonia and Tozan Alkan, Turkey while in Bulgaria. This month he’s off to Greece to receive an award and connect with more poets. Distinguished poet, George Wallace will be the first American citizen to receive the Alexander the Great Gold Medal (Χρυσό Μετάλλιο του Μεγάλου Αλεξάνδρου) in Greece this coming Sunday. Bestowed by the United Nations Educational, Scientific and Cultural Organization (UNESCO), Wallace will be traveling to the island of Salamis along with around 20 others who have made advancements with culture. He was selected by the organization due to his connection to the director, Kafe Idion, who he met at a poetry festival in Macedonia in 2017. After sharing his work with Idion, he was asked if he could be considered for the medal and within a month received a letter saying that he was chosen. Although, his trip to Greece will be brief, Wallace is hoping to reconnect with poets and musicians he had encountered on his travels to the country before. He is also looking forward to encountering various artists during his time Salamis off the coast of Greece. “It reminds me of the responsibility I have not just to myself but also to the people I represent, the Walt Whitman Birthplace and The Long Islander, to conduct myself and offer myself in a way that brings honor to the people I represent,” Wallace said. Wallace has been the writer in residence at the Birthplace since 2011 and helps them organize events. He also spent many years working at the Long Islander newspaper and continues to contribute to the poetry column he brought back. For thirty years, the Long Islander has been sharing poets’ work from across the globe, with over 1,500 poems published. To Wallace, the key to cultural development is the “meeting of minds,” which he encourages by reaching out to other cultures in the United States and internationally. He works to find commonalities and connections between cultures. As the writer in residence for the Walt Whitman Birthplace, Wallace has brought in poets from around the world. In his travels abroad, Wallace has worked to share poetry from across the world. He also, invites poets from other nations to read their work at the Walt Whitman Birthplace, bringing their culture to Huntington. Recently, Wallace traveled to the border between South Texas and Mexico, to speak with individuals on both sides about how they felt about the controversy it has caused. He wanted to gain a sense of what the border meant to either side, as a way to create a dialogue between both sides’ cultures. “We can either retreat into our caves or we can step out into the sun and greet each other as fellow human beings,” Wallace said. A native Long Islander, Wallace lived in England for 20 years but eventually came back to his roots in Huntington and began to pursue poetry professionally. He finds that as he has grown and changed in life, what he writes about has evolved as well. He choose poetry as a career because he felt he had a talent with working with words and wanted to grow his potential. While he does write about his own life, he also touches upon issues that face society. Pop-culture fans will get the chance to take part in a live game show at The Paramount in Huntington next week about all things Comic-Con. The trivia show was first developed in 2015 by co-creators Steve Sellery, CEO of Iconic Media Group, New York Times best selling author Philip Van Munching and actor Bruce Campbell. Campbell, best known for his role as Ash Williams in the numerous renditions of The Evil Dead franchise, hosts Last Fan Standing. Campbell is a familiar and popular face at Comic-Con panels across the country. The show starts with an audience response round where each ticket holder gets a chance to earn a spot next to Campbell on stage. Using a clicker audience members answer 25 multiple choice questions on the show’s four major categories: fantasy, horror, sci-fi and superheroes. “If you can find it at Comic-Con, you’ll be asked about it here,” Campbell said. The interactive nature of the show creates a party-like atmosphere. Some contestants show how dedicated they are as fans by cosplaying, or dressing up as a character from a comic book, movie or TV show, at the competition. In addition to his self-deprecating comedic style, Campbell also commands the stage during the show in one of his signature flashy suits that Comic-Con fans have grown to love. Fans can test their knowledge of pop culture and try to become the last fan standing at The Paramount on Oct. 10. Doors open at 7 p.m., and the show starts at 8 p.m. Tickets range from $20-$40 and can be purchased at the box office or online at Paramountny.com. The eighth annual Huntington Awareness Day Unity in the Community Day parade and fair kicked off on Saturday as hundreds of students and community members took to the streets to celebrate diversity and solidarity in Huntington. Co-chaired by Dolores Thompson and South Huntington Superintendent Dr. David Bennardo, the event began with a parade from HuntingtonHigh School up Oakwood Road to StimsonMiddle School in Huntington Station. Greenlawn American Legion Post 1244 provided the color guard as marching bands, cheerleaders and fire trucks created an exciting atmosphere for the parade. What began as a day to raise awareness for the necessary revitalization of Huntington Station has expanded to include groups from across the Town of Huntington. Each year the school districts present awards to honorees who displayed outstanding commitment to the local community. Imam Ibrahim Ahmad, of Masjid Noor in Huntington, received the Excellence in Community Awareness. Jessica Kennedy, Rosario Lorenza and Kristin Orig, teachers from Elwood, Huntington and Northport, respectively, were honored with Excellence in Education award. Walt Whitman High School graduate Julio Taku received the Excellence in Community Leadership award, and Harborfields High School student Christina Amari was honored for her Excellence in Student Leadership. After the awards ceremony, community members and residents stayed late into the afternoon to enjoy the company of their neighbors and the rides at the fair. The work of three artists comes together in harmony to transport viewers through Long Island at the recently opened Huntington Arts Council exhibit, Beyond the Sound. This invitational exhibit features the works of Grainne de Buitlear, Jean Cohn, and Michael Ricigliano, Long Islanders who think outside the box and feel they go “beyond the Long Island Sound.” The artists came up with the name of the exhibit and feel this title encapsulates all three of their bodies of work, with two artists focusing on water-based pieces and the other taking influences from nature and putting it into his work. The exhibit will run from September 21 through October 13. Taking a stroll around the gallery, it is evident which pieces come from a particular artist due to their unique styles. Their style and subjects all come from their different paths of life. Buitlear is primarily a painter and works with pastels, Cohn is an art teacher for children pre-kindergarten to sixth grade and weaves mixed mediums, and Ricigliano practices law and creates figurative work based on what he sees. 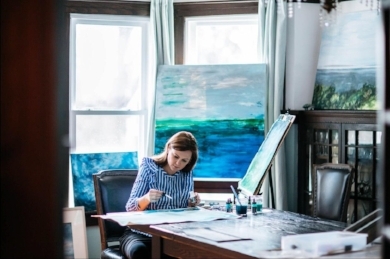 Artist, Grainne de Buitlear has fallen in love with the Long Island coast and the nature that surrounds it. Originally from the east coast of Ireland, she finds many similarities between living on the coasts of these places and finds herself gravitating toward it. After moving to New York in her 20s to pursue acting, Buitlear found love and decided to stay in the States. She now has a studio in her home in Port Jefferson, that has given her a creative outlet between raising four kids. Buitlear reflects on her time as a child as a time when she developed her creativity, with a mother as a set designer, she has been painting since she was seven years old. Although, Buitlear knew she loved nature and wildlife, she did not start painting landscapes with pastels until two years ago. This is when she began to submit her work to galleries around Long Island and joined the LIMArts collaborative arts group. “They had asked me to do a show a year ago and I said, ‘No way, I couldn’t have the time to make such a body of work.’ And they asked me again and I just thought that was a challenge that would make me work harder and pour my heart into,” Buitlear said. What’s unique about an invitational show is the amount of work that is displayed by each artist. Typically, an exhibit would allow only one or two works from each artist but an invitational displays an artist’s body of work. The artists were selected by Emily Dowd and Kieren Johnson, co-curators in exhibition program, based on the cohesiveness of their works. The Huntington Arts Council holds two to three invitationals a year, that allows artists to showcase their pieces, selected by them. Buitlear choose to display her landscapes created at West Meadow Beach, Belle Terre Beach, the Hamptons, Montauk, and other coastal areas on Long Island. “I really did base my work on the edge of the Sound and kept my work very coastal based, just beyond the water, the greens, and the vascity of that landscape around it,” Buitlear said. All pieces on display are for sale and can purchased during the duration of the exhibit. The gallery is open 9 a.m. - 5 p.m. on weekdays and 12 - 4 p.m. on Saturday. Shannon Bex, Dawn Richard and Aubrey O’Day are reuniting for to perform the hits from Danity Kane. 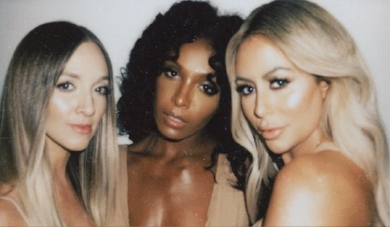 Three of the original members of the female pop group Danity Kane are reuniting on stage for the first time in four years. The trio, calling themselves DK3, consists of Shannon Bex, Aubrey O’Day and Dawn Richard. Bex, 38, O’Day, 34, and Richard, 35, performed as DK3 for a brief time in 2014. Danity Kane’s third album, “DK3,” was released at the end of 2014 after the trio had already disbanded. The five original members of Danity Kane were discovered in 2005 by rapper and producer Sean “Diddy” Combs during the filming of the show Making the Band 3. Aundrea Fimbres and Wanita Woodgett joined Bex, O’Day and Richard in the band’s first lineup. The band’s debut album, self-titled “Danity Kane,” topped the U.S. Billboard charts in August 2006 and produced the top ten single “Show Stopper.” In 2008, Danity Kane released their second album “Welcome to the Dollhouse,” which also debuted atop the Billboard Top 200. The success of Danity Kane’s first two albums earned the band a spot in the Guinness Book of World Records as the first female group in Billboard’s history to consecutively produce albums that debuted at the number one spot. The five members of Danity Kane never got the opportunity to continue to build upon the popularity of their first two albums. By early 2009 internal conflict within the band resulted in a breakup. Bex, Fimbres, O’Day and Richard briefly reunited in 2014, but disbanded again roughly six months later. Several members of the band, including Bex, O’Day and Richard, went on to pursue other musical ventures. Bex and O’Day continued to work together releasing music as the duo Dumblonde, while Richard has had a successful solo career. DK3’s show at The Paramount will feature performances from Richard’s solo project, as well as a second act featuring music from Dumblonde. DK3 is scheduled to take the stage at The Paramount on Oct. 2, and doors are set to open at 6:30 p.m. for the 8 p.m. show. Tickets range from $25-$75 and can be purchased at the box office or online at Paramountny.com. Susan Capurso wants to bring tranquility to a person’s journey of moving from this world to the next. The topic of death can be one that sends goosebumps up someone’s spine, no one wants to face this but it is something that inevitably comes. What if someone could pass on in a peaceful way that leaves them feeling they have lived a fulfilled life? This is the mission of Susan Capurso, founder of East End Doula Care, who wants to change the view of end of life care and improve a person’s journey into this last chapter of their life. As a certified doula, Capurso is emotionally supportive and can guide a person and their family during this time. She also provides elder care assistance to people who may not be at this part of their life, but still need support and guidance. “For years and years doulas have helped bring babies into the world and now we’re helping people leave the world more peaceful and with less anxiety,” Capurso said. When someone feels they are close to death, it can leave both them and their family feeling afraid and overwhelmed. This is when Capurso comes in, she will put forth techniques to change the family dynamic and mindset. She learned this during her training from Doulagivers in New York City which taught her the three phases of care. Capurso offers many service packages and feels she offers her clients a renewed outlook and experience. She offers discounts if someone uses her services in the long term, which can be found on her website EastEndDoulaCare.com. Also, Capurso offers telephone guidance for a small fee if someone is in need of quick assistance, she can help them plan for what is to come and offer them referrals. One of the services she offers is her creativity through legacy projects that she will work on with the person for a few hours a week. Something as simple as writing birthday cards for their children over the next 10 years, to be delivered every year, can let the person know their words will carry on for years after they have passed. As an outsider to the family, Capurso does her best to educate the family on what could happen when the person is nearing death so they are prepared. By doing this, she can remind them when the time does come certain signs and symptoms are normal and natural. Working as a volunteer for Hospice for four years, Capurso has experienced this process many times before, which helps her to identify symptoms that a person is experiencing close to the end of their life. Once in your End of Life Chapter, Capurso will work with them on their advanced directives by utilizing the five wishes program. These directives outline what a person would like to happen if they could not speak for themselves any longer. She also helps write personal eulogies, enabling them to express their feelings in the moment, even when they are not there. “It’s all the little things that are going to help you make your end chapter, a better story. Every one of us want to leave with grace and dignity feeling more complete and with closure.” Capurso said. Whatever a person’s diagnosis, Capurso wants to make their transition into this last part of their life, a smooth one that is not filled with fear and anxiety. This is a time for someone to finish many of the things they always wanted to do, a bucket list, being one. She gives the example of someone who has always wanted to visit the Grand Canyon. Although, they may not physically be able to go there, she would get popcorn, snacks, and videos that give a tour through the Grand Canyon and do a theme night for the family to remember forever. Those interested in becoming an End of Life doula, can contact Capurso and visit doulagivers.com. Get a better picture of Northport’s history through stories and photographs in Images of America: Northport, a newly released book by Teresa Reid and Robert Hughes. Both authors come with a background of historical appreciation that makes them the perfect team for weaving the village’s history. Reid has been working with the Northport Historical Society as their collection consultant and exhibit curator for 15 years. Hughes is the official Huntington Town Historian and has authored similar books about Cold Spring Harbor and Huntington Village history. The duo decided to partner in writing the book at a Northport Historical Society fundraiser last summer. The Images of America series covers many towns across the country, including Greenlawn and Huntington. Northport was a fit for the series due to its exceptional architecture and wealth of photographs. The format of a picture book readily grabs a reader’s attention and interest. The work for the book was divided between the two authors, allowing each to write about what appealed to them most. It was completed early this year and released by Arcadia Publishing on Sept. 10. Each photograph in the book is accompanied by a detailed description of what it means to Northport’s history. Reid and Hughes went through many photographs and documents in the digitized collection of the Northport Historical Society. “Northport Historical Society was really invaluable with their immense collection of photographs and subject files, that we could research just about any topic that we chose,” Reid said. When a picture was not available, the authors substituted a document or shot a present-day photograph. They filled missing gaps in information by looking at old newspapers and got help from village historian, Steven King. Many records were preserved thanks to past historians, who are thanked on the acknowledgements page. Royalties from the book will be donated to the Northport Historical Society and used to aid the preservation of their collection of Northport history. The authors feel that the preservation of Northport’s history is best done through telling stories of the village, which gives readers an appreciation of the buildings and landmarks that surround them. “It’s very important for everyone to know, because as they say, ‘You can’t figure out where you’re going if you don’t know where you’ve been.’ There are a lot of lessons to be learned from the past,” Hughes said. By reflecting on events of the past, people can inform their decisions for the future. The book also shows that Northport has a long history of having a tight knit community, which hopefully will inspire readers to continue this tradition. Those who live in Northport and neighboring communities are sure to enjoy this historical read, which will give them more insight into the village’s intertwining stories of the past. Copies of the book can be purchased in local bookstores, at Northport Historical Society, or online for $23.99. A book launch event will be held on Friday, Sept. 14, at Northport Historical Society (215 Main Street) from 7-9 p.m. The authors will be speaking about the writing process and giving insight on their favorite parts of the book. They will be signing copies as well. Comedian Dana Carvey is scheduled to bring his style of characters and impersonations to The Paramount on Sept. 11. Comedian Dana Carvey is best known for his performances on Saturday Night Live that reinvigorated the sketch comedy show in the late ‘80s and early ‘90s, but the pressure of a weekly live show in front of a national audience was something that took a little getting used to. Carvey, 63, became a household name on SNL in 1986 on the back of his popular character impressions that included Church Lady, Garth Algar - of Wayne’s World - and George H. W. Bush. For Carvey, SNL was his first attempt at sketch comedy since he began his standup career in San Francisco during the late ‘70s. “It took awhile for me to get used to being in sketches,” Carvey said. Carvey’s characters were a hit with the audience, and in 1993 he was awarded the Emmy for outstanding individual performance in a variety program. Carvey said his famous Church Lady character was inspired by the memory of patronizing schoolteachers from his childhood. When working on his impersonations, Carvey said he feels “the main thing is just listening” to the person’s voice. He also allows himself to use some creative license. “I’ve never been obsessed with complete accuracy. I’m always looking for some kind of a rhythm or take on it that makes me happy in my brain,” Carvey said. Carvey is scheduled to perform at The Paramount in Huntington on Sept. 11 with an opening act by his sons Dex and Thomas Carvey. Carvey said his standup show is a reflection of what is going on in the world at the moment, and audiences can expect to hear the voices of Donald Trump, Vladimir Putin and other relevant names from the front pages of the news. “My standup is a lot of riffing with characters and impressions, and working with my sons gives me a chance to hatch a lot of new ideas,” Carvey said. Doors open at 6:30 p.m. for the 8 p.m. show. Tickets for the show range from $49.50-$79.50 and can be purchased at the box office or online at Paramountny.com.